Wow, I can’t believe it’s been over a year since I last posted here. Unfortunately, cancer can steal bags of time from you. At the moment I’m doing fairly well, and planning some events for late Summer and Fall. Hopefully by Winter, I’ll be back to something like my normal schedule. In the meantime, I have worked up a new product, called a soroban, used for kneeling. This is a variation on a 17th century Japanese device for torturing confessions out of prisoners. It can be rolled up and easily put in a rope bag. When I am working on something, I tend to batch my work as much as I can. That means when I do something like put handles on paddles, I may do 10 to 20 at a time (clamps permitting). While working on that a couple of days ago, I figured out two new things that make the placement of the handles somewhat more accurate. Change can be good. A few weeks ago, I was asked to look into making Soroban for Ishidaki. This is a series of triangular pieces of wood that are placed on a suitable surface for someone to kneel on. Yes, you kneel on the pointy parts. I don’t plan to have the upper apex of each piece to be a sharp angle, but rather round them off with a router. However doing this with a triangular piece of wood is not easy. After some thought, I decided to do all my finishing of the wood while it is a square piece, then cut it on a diagonal, from corner to corner. After more thinking, it seemed safer to do this with a sled for my table saw. My first try showed me that it was much easier to feed the wood into the saw than it was to move the whole sled. My sled quickly began to morph into a jig. Today, I added a piece of wood to act as a riving knife, preventing the two pieces of wood from bending back towards each other as the piece is cut. Hopefully everything will work out properly, and my eyeball measurements are accurate. Every year I create a new paddle style to donate to events that have either a silent auction, or a raffle. For the first time in four years, I am absolutely ready for this year. I selected the wood last year, and got all of it that I’m cutting cut in early January, sanded and ready for glue-up yesterday. 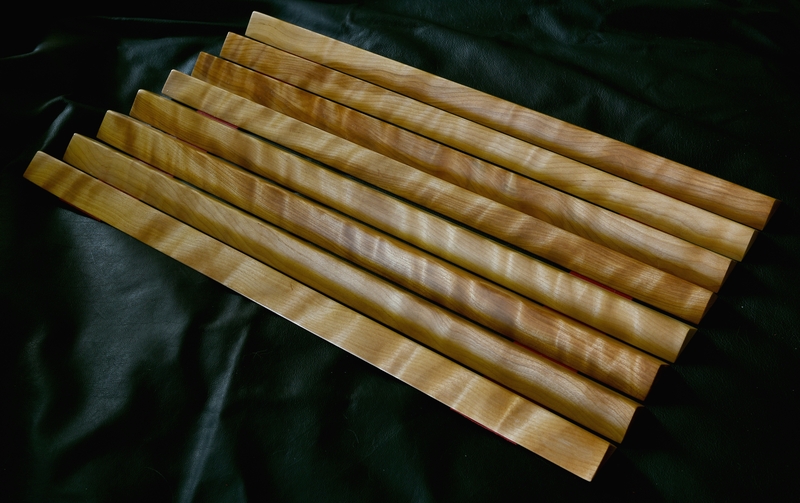 This year’s paddle is made from padauk, with maple and rosewood pin striping, and ebony paddles. For a couple of years now, I have been making laminated paddles and sticks. I use veneer in many ways, from pinstriping to the outer layer of a piece. During that time, I’ve been limited to whatever wood someone else offers for sale, usually on eBay. Of late, I’ve been using a lovely band saw at my local maker’s space. It is properly set up, and allows me to dependably cut 3/32 inch slices of wood. After a pass through the thickness sander there, then a few more passes through my new drum sander, they are ready for glue-up with a nice, even finish. It’s nice to be able to make my own pieces, I seem to find much prettier wood than the folks on eBay offer. 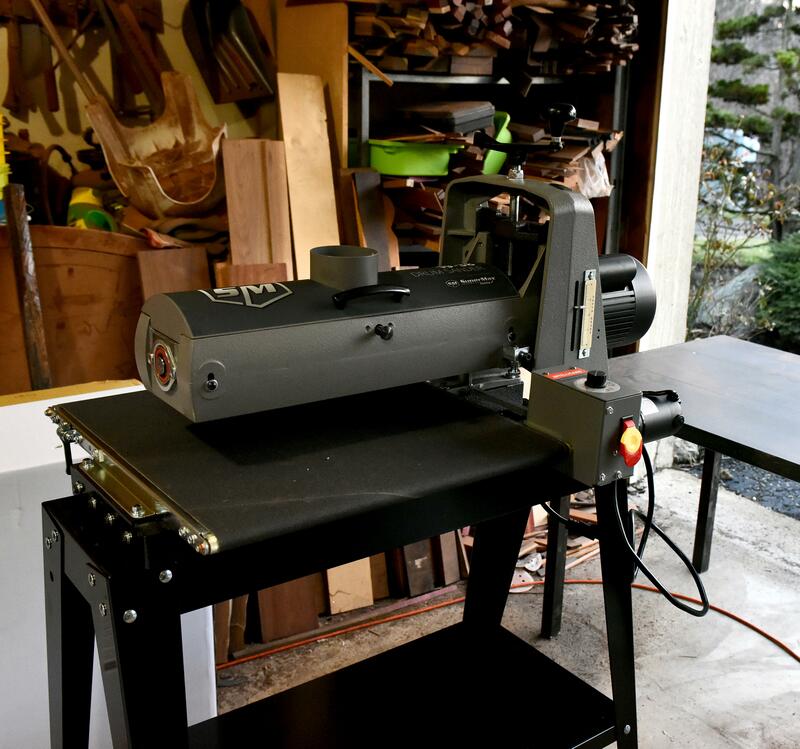 I recently purchased a drum sander for my shop. It will allow me to take on a couple of new projects, and hopefully speed up my work a bit. It will be able to do all my rough sanding on flat surfaces so that I only have to do the final two steps by hand. My good friend arcane came over to help me get it set up. The main part of the unit weighs just under 200 pounds. My good friend arcane and I have created a new entity called Impact Artisans. It allows us to book a double space at an event, and be sure that we will be together for mutual support and good company. We recently booked CLAW that way.